Truth Tuesday – How Will You Respond to God’s Interruption During This Christmas Season? When we meet Mary for the first time in Scripture, she is a young girl, probably between the ages of 12 and 16, and engaged to be married to Joseph. No doubt, this was just an ordinary day when suddenly the angel, Gabriel, appeared and announced to Mary news that certainly must have startled and confused her, to say the least. Gabriel tells her that she will conceive a son, that his name would be Jesus, and that he would be called the Son of the Most High. After Gabriel announces the news that will change not only her world, but the entire world, Mary asks Gabriel a question – How will this be since I am a virgin? Mary’s question wasn’t doubt, she simply needed to know the how, “seeing I know not a man”. Mary was a virgin. Gabriel answers Mary’s question with an explanation that the Holy Spirit would come upon her. As she is hearing this I imagine all the things that would be going on in my head had I heard this news. And they would all be leading to “how in the world?! !” type scenarios. Gabriel ends his explanation with “Nothing is impossible with God.” (Luke 1:36). To make this an even more tangible understanding for her, Gabriel goes on to tell her that her childless cousin Elizabeth, who was too old to have a baby, was already in her sixth month! When God sends Gabriel to interrupt Mary’s day, her response reveals such a beautiful picture of her humble, serving heart – a heart that simply would trust God no matter how impossible, how difficult, how embarrassing, how misunderstood this new journey would be in her life. She responds, “May it be to me as you have said”. Mary trusted God and therefore was willing! As you go through this Christmas season, look for ways that God wants to surprise you and interrupt your day for His purposes and plans. Spend time in prayer today, purposing to surrender your heart to the tasks/assignments God lays on your heart in the days to come. I have no doubt that God will interrupt you over and over in the coming days. 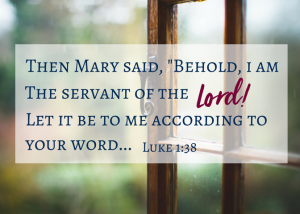 Will your heart be full of trust like Mary’s was and eagerly say, “yes, Lord“, bowing in obedience to nothing other than your Lord Savior and King?